Modernism was a term mostly used by Pope Pius X to describe the doctrines of a group of theologians (chiefly Alfred Loisy and George Tyrell), notably the assumption that the Christian Church and its dogma are human institutions that have evolved in time like other institutions, and which are expressed like others in human documents that bear the character of their historical context, which can be profitably analyzed in just the way all institutions and texts are scrutinized. Catholic "modernists" did not use this label for their own writings. They did not see themselves as a unified group: the term "modernist" was applied to them. In his encyclical Lamentabili Sane of July 3, 1907, Pius X, “the fact that many Catholic writers also go beyond the limits determined by the Fathers and the Church herself is extremely regrettable,” presented a syllabus condemning the errors of the Modernists in 65 condemned and proscribed propositions. In his encyclical Pascendi Dominici gregis of 1907, Pius X described Modernism as “the synthesis of all heresies” (Pascendi Dominici gregis, 39). This description was used not because Modernism combined ideas from many earlier heresies, but because it undermined Catholic doctrine in a more fundamental way than most earlier heresies: instead of critiquing particular points of doctrine, or setting up a competing source of authority, it denied the idea of objective unchanging truth or any authoritative teaching. Modernism involved the evolution of dogma, which means, according to them, that the teachings of the Church, which its members are required to believe, can evolve over time – not only in their expression but also in their substance – rather than remaining the same in substance for all time – in the Divine Revelation in Sacred Scripture and Tradition – which was present from the beginnings of the Church. This postulate was what made Modernism unique in the history of heresies in the Church. In stating the Modernist view on evolution of dogma in order to condemn it, Pius X expressed this as: “Truth is no more unchangeable than man himself, for it evolves with him, in him and through him” (Lamentabili sane). In some respects, the Catholic Modernists seemed to be influenced by or in agreement with certain Protestant theologians and clergy, starting with the Tübingen school in the mid-19th century. Some, however, such as George Tyrell, disagreed strongly with this analogy; Tyrell saw himself as loyal to the unity of the Church, and disliked liberal Protestantism (Hales 1958). In some respects the Church appeared to be reacting to cultural themes that had arisen with Renaissance humanism and had informed the "Enlightenment" of the 18th century. The Modernist crisis took place chiefly in French and British intellectual Catholic circles, to a lesser extent in Italy, and virtually nowhere else. Dogmas are "truths fallen from heaven"
Pope St. Pius X, Lamentabile, The Errors of the Modernists, July 3, 1907, #22: “The dogmas which the Church professes as revealed are not truths fallen from heaven, but they are a kind of interpretation of religious facts, which the human mind by a laborious effort prepared for itself.”- Condemned statement by Pope St. Piux X.
Dogmas are truths fallen from heaven which cannot possibly contain error. They are not merely human statements, written to warn Catholics and non-Catholics, which are subject to correction and qualification. Dogmas are infallible definitions of the truth which can never be changed or corrected, and have no need to be changed or corrected since they cannot possibly contain error. Dogmas are defined so that Catholics must know what they must believe as true from divine revelation without any possibility of error. I frequently see writers refer to what they call “modernism.” Exactly what do they mean by this term? The history of “Christendom” for the past twenty centuries has been characterized by cycles. One of those recurring cycles is that of theological modernism. Modernism is a determined effort on the part of those who have lost their personal faith in the divine origin of the Holy Scriptures to convince others of their impoverished views. Modernism repudiates the biblical description of the nature of God. The God of the Old Testament is seen as a hateful deity of vengeance and is rejected. Albrecht Ritschl, for example, repudiated the Bible affirmations regarding Jehovah’s holiness and wrath and viewed the Lord solely as a being of love. This view overlooks the justice of God, failing to recognize that Jehovah will punish the rebel. Modernism attacks the scriptural account of creation, suggesting that the Mosaic record is simply an ancient “myth” (cf. The Interpreter’s Bible, I.460ff). It denies that man has fallen from his holy estate; rather, it asserts that humanity has actually ascended from a brutish state (via the evolutionary process) to its current status. 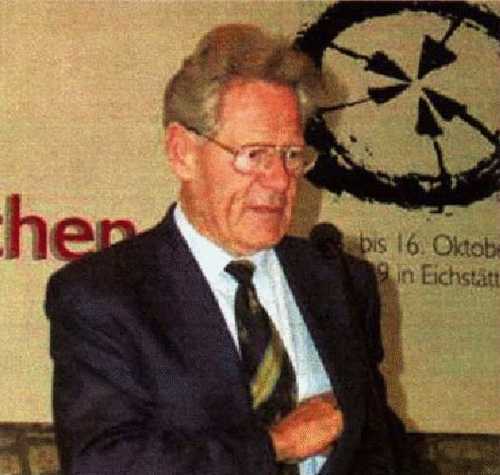 Lutheran theologian Helmut Thielicke declared that he was not embarrassed to confess that his grandfather was a monkey and his great-grandfather a tadpole. Modernism adopts a “higher critical” attitude toward the Bible, which ignores the testimony of Scripture itself. For example, it is claimed that Moses did not author the Pentateuch, as both Old and New Testament evidence suggest; rather, supposedly, the first five books of the Bible are but a compilation of documents (e.g., J, E, P, D—the initials signifying Jehovah, Elohim, Priestly, and Deuteronomic—code names for the alleged authors). Modernism contends that the Bible, as a historical record, is not trustworthy. Advocates of this viewpoint do not hesitate to assert that the Scriptures contain a host of errors of a considerable variety. They believe that the basis of the biblical record is an ancient legendary tradition. Modernism, therefore, seeks to “de-mythologize” the Scriptures. Anything of a miraculous nature must be explained away as having some natural, though perhaps misunderstood, nature. According to this ideology, for example, Jesus did not walk upon the waves of the Sea of Galilee; instead, he was merely walking in the shallow surf near the coast, and the disciples, from a distance, just thought he was upon the surface of the sea. Modernism asserts that human conduct cannot be regulated by a “rule book” such as the Bible. Instead, one must individually make his own decisions on ethical issues, letting subjective “love” be the guiding principle in various situations. Joseph Fletcher’s school of situation ethics has peddled this hedonistic ideology. There are additional modernistic traits that might be mentioned, such as the condemned heresy that dogmas can change their meaning, but these will suffice for the present. It hardly needs to be pointed out that “modernism” is actually just another term for infidelity. Theological modernism was technically set forth in the writings of such men as F. D. E. Schleiermacher (1768-1834) and A. Ritschl (1822-1889). Later it was popularized in the works of men like Harry Emerson Fosdick (1878-1969). Fosdick, an American Baptist "minister", authored some thirty books, including The Modern Use of the Bible and A Guide to Understanding the Bible. He was quite influential in the liberal movement that now ravages modern Protestantism. Many religious movements, to greater or lesser degrees, have been influenced by this insidious philosophy. Because some of these heretics are obstinately immoral, they ultimately justify their immorality by denying dogmas that deal with morality. For instance, a man who commits the sin of adultery ultimately justifies his sin by denying the moral dogma that adultery is a mortal sin. To justify changing the meaning of the moral dogma of adultery so that it is no longer a sin, he embraces the heresy that dogmas change their meaning. “26. … They lay down the general principle that in a living religion everything is subject to change, and must in fact be changed. In this way they pass to what is practically their principal doctrine, namely, evolution. To the laws of evolution everything is subject under penalty of death—dogma, Church, worship, the books we revere as sacred, even faith itself. John 17:12- "None of them is lost, but the son of perdition, that the scripture may be fulfilled." According to Benedict XVI, everything from Mark 16:9 to Mark 16:20 is not part of the original Bible, “the authentic text of the Gospel as it has come down to us”. He excludes this rather important section from the authentic biblical text. The fact that there have been various views on the ancient manuscripts as they relate to Mark 16 is irrelevant. In the ancient Church, there were also disputes about which books constitute canonical Scripture. 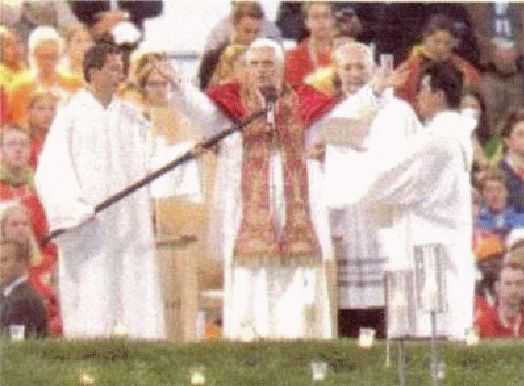 Since the Church has confirmed the authenticity of Mark’s Gospel, from beginning to end, as it is used in the Catholic Church, Benedict XVI’s statement is heresy. In fact, it’s interesting to consider that the First Vatican Council dogmatically incorporated into its infallible decree the very portion of Mark’s Gospel which Benedict XVI denies. 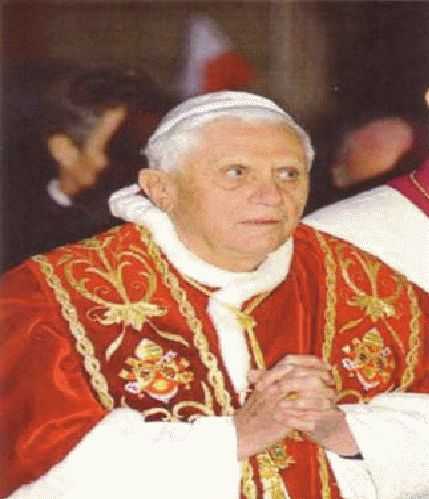 If you still believe that Benedict XVI is the pope, then you and he don’t even have the same Bible. The Errors of Peter Abelard, Condemned by Innocent II, July 16, 1140, #10: “That they have not sinned who being ignorant have crucified Christ, and that whatever is done through ignorance must not be considered sin.” – Condemned statement. This is a total rejection of Catholic dogma. It is heresy, blasphemy and apostasy. The destruction of the Jewish Temple and the end of its cult signified that Judaism is dead. The Messiah had come. All true Jews were to be incorporated into the universal covenant of the Savior. There is no future or re-discovery for Judaism after the destruction of the Temple. It’s over and finished; it has passed into the Church. Francis has been making headlines ever since he was elected Antipope on March 13, 2013, and now he’s getting even more attention. 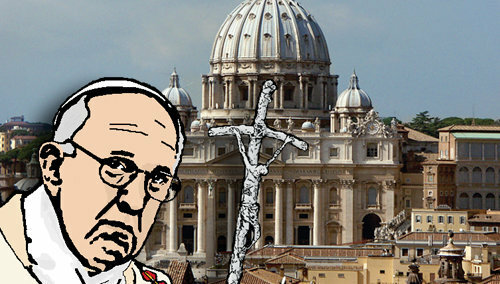 “I believe in God, not in a Catholic God,” he said in an interview. Antipope Francis, October 1, 2013: “And I believe in God. Not in a catholic God; a catholic God does not exist; God exists. And I believe in Jesus Christ, his incarnation. Jesus is my master/teacher and pastor, but God, the Father, Abba, is the light and the Creator. This is my Being. Do you think we are very far apart?” Francis said in the interview with the Italian newspaper La Repubblica. 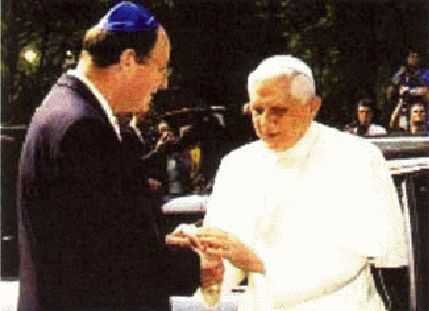 Bergoglio is a complete Modernist on top of an apostate and heretic. First, he says, “There is no Catholic God;” which is complete heresy; and then he says, “And I believe in Jesus Christ, his [Francis’ non-Catholic God’s] incarnation.” Jesus is the Second Person of the Holy Trinity and is God, the Catholic God, He is the Incarnation of God and, as the Last Gospel makes clear, is God. Francis then says, “God is my light, Jesus is my teacher. This is my Being. Do you think we are very far apart?” Yes, Francis, we believe you are very far apart. In fact, you are as far apart from God the Father as Hell is from Heaven! Francis is clearly on a mission to try to destroy anything Catholic. He doesn’t even believe in the Catholic God, let alone believing that the Catholic faith is necessary for salvation. Francis is a clear Modernist/Heretic/Apostate, like Martin Luther was a Lutheran and Arius was an Arian. 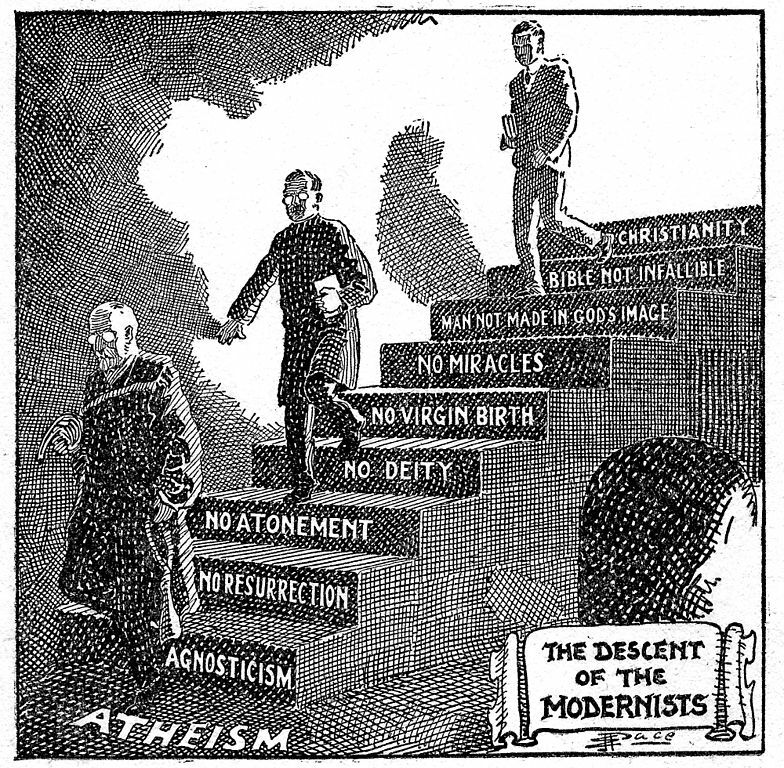 And modernism is a condemned heresy just like Arianism or Luthernism. Saint Paul doesn’t say this. This is outrageous. Notice that the only sin Francis speaks of is not giving people food or work; he says nothing about sins against God and God’s faith. St. Paul teaches that atheists are inexcusable because God’s creation proves His existence. Vatican II and Francis, on the contrary, teaches that atheists can be excused and saved. This causes us to ask, “What bible was Vatican II and Francis using?” It must have been the revised satanic edition. Their statement about those who don’t acknowledge God is not only condemned by St. Paul, but also by Vatican Council I. Vatican I dogmatically defined the principle set forth in Romans 1 – which directly contradicts the teaching of atheism, agnosticism, Antipope Francis and the Vatican II sect.